Coach Jamie Main talks about his future hopes for the DIS swimming programme and swimmers on the elite pathway within the county. Jamie Main in his DIS gear at Ripley Leisure Centre's swimming pool. 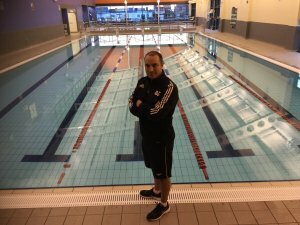 Jamie Main, performance swimming coach of the Derbyshire Institute of Sport (DIS) and also head coach of the Derventio eXcel county squad, reveals how he was inspired into coaching - and what the future holds. "I swam to a national age group level in the mid-90s and got into coaching when a finished competing at the age of 18. "My coaching inspiration at the time was my coach, Bill Furniss, British team head coach in 1996, who ended up being my boss. "When Bill found out I was coaching at a local club he invited me to coach the age group swimmers at Nova, the Nottinghamshire performance squad. We worked together for over 20 years as swimmer/coach and as a coaching team, producing world class swimmers and national team champions, including Rebecca Adlington, a four-time Olympic medalist and 2008 double Olympic champion. Jamie at the poolside coaching Derventio eXcel swimmers. "Within four years I'd developed the age group programme to be number one in the Midlands and in the top three nationally. The opportunity came along through governing body funding for me to go full time and manage the competitive pathway within Notts. This produced a change in culture to a performance mindset across the younger squads. 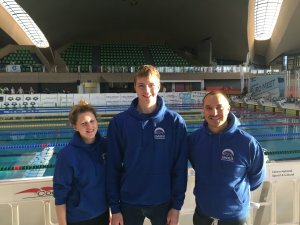 "Th effort was worth it as it led to being crowned national club champions on two occasions and producing more national level swimmers than any other programme in Britain over my time at Nova. "When Bill moved on to become British Swimming head coach in 2012, I took over as Nova head coach. This continued the successful production line of top class talent and coaching philosophy. Jamie with DIS swimmers Emily Osborne and Jamie Ingram at a meet in Luxembourg. "After a career break from coaching, I became head coach at Derventio eXcel in October 2015, which is the Derbyshire performance swim squad, and also performance swim coach at the Derbyshire Institute of Sport (DIS). "During my short time in Derbyshire, I have coached DIS gold swimmer Imogen Clark to break the oldest female British record in the books and Jamie Ingram to become one of the fastest junior swimmers in Britain. "The future is exciting for swimming in Derbyshire with the current crop aiming for senior international representation at major games & competitions. "The support from Derbyshire Sport and the DIS partnership is pivotal to developing emerging talent Ito world class performers." You can also sign up to Coaching Derbyshire to get e-newsletter updates.